Auctions sometimes feature the original drawers. In 2010, a piece of furniture with six drawers was sold for €380, another with ten for €1000, and another with nine for €1200. Marxist, feminist, architect and activist, Margarete Schütte-Lihotsky was always used to making an impact. But when she first dreamt up the Frankfurter Küche (Frankfurt kitchen) in 1926, even she couldn’t have known the influence it would go on to have. Measuring a meager 1.9m x 3.4m, and inspired by the compact kitchen facilities of the luxury modern railcar, Lihotsky had invented the first mass-produced fitted kitchen, and the world has never looked back. Eighty-five years on, lifestyles and priorities have changed dramatically and the humble kitchen cabinet today is transformed with modern technology and meticulous detailing. Today’s smart, gliding doors open onto entirely new horizons of promise and produce. At the risk of compounding a cliché (or two), if the Frankfurter was the mother of all kitchens, then the apples haven’t fallen far from the tree – Germany is still the leading land when it comes to über efficiency and innovation in this domestic domain. At the 2011 imm furniture fair in Cologne (the very place where the Frankfurt kitchen was first launched) a Teutonic host of contemporary manufacturers dazzled with a world of new mechanisms and materials at a new trade event called ‘Living Kitchen’.. Super surfaces and capable curves now bring what was once a simple functional space into the centre of 21st century living and prove that the kitsch is also out of the kitchen for good. Amazingly, there is much that today’s manufacturers have to thank Lihotsky for. A rare woman modernist, with proven experience in social housing, she was brought on board when Frankfurt’s chief architect Ernst May launched an ambitious initiative to address the enormous post-war housing deficit in the city almost a century ago. The task was the creation of new ‘minimum dwellings’, small and highly rationalised machines for living in, where space and budget constraints forced radical innovation. Lihotsky’s job was to look after the kitchen. 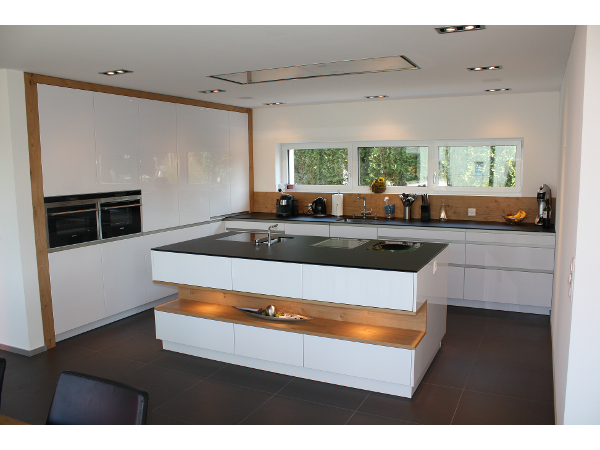 Nothing was unconsidered in the Frankfurt kitchen, every cubic millimeter precision planned. Carrying out detailed time-motion studies to optimize ‘workflow’ as if it were a (albeit miniature) factory, Lihotsky measured how long it took to do certain tasks, duly adjusting and readjusting the prototypes along the way, and prioritising contemporary ideas about efficiency and hygiene alongside feedback from the housewives and women’s groups she personally grilled for information. High up on the agenda too were the theories of Scientific Management, by Frederick Winslow Taylor, to maximize domestic efficiency, and of course Henry Ford’s call to mass production. The result was a table-free galley space, featuring sitting-height countertops, and all mod cons including a swivel stool, gas stove, a fold-out ironing board, and an adjustable ceiling light. Built in storage in the fitted Frankfurt kitchen included an easy-to-reach spice rack and oak flour containers. Natty aluminum drawers for dry goods such as sugar and rice allowed you to pull them out and pour the necessary quantity in one swift efficient arm movement. 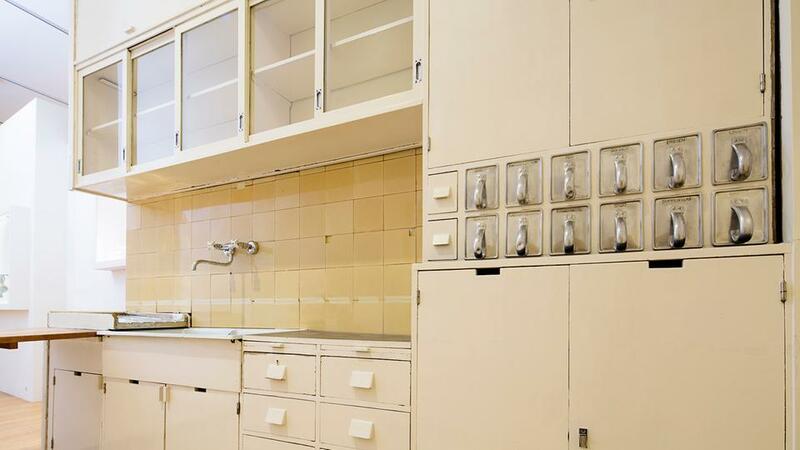 Fitted kitchens did in fact exist at the time, but Lihotsky’s was the first to be mass produced, and certainly on such a scale: Some 10,000 were installed. Reactions at the time were mixed, and largely critical, which is unsurprising considering the concept was so unlike what anyone was used to in a domestic setting. A typical European kitchen at the time was big and filled with big, standalone items of furniture it had evolved in a labour-intense environment. This pokey production zone with space for only one ‘worker’ to move comfortably was going to take getting used to. 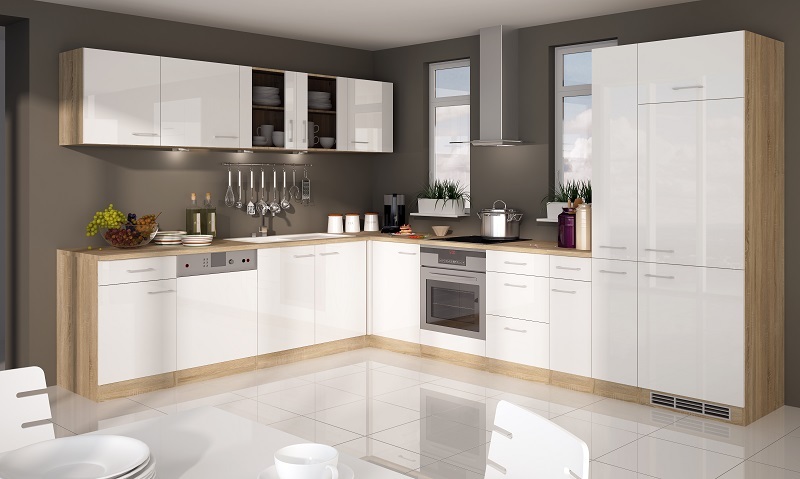 Fast forward to the contemporary designs and it becomes apparent that the fitted kitchen is undergoing a new revolution, merging once more with living spaces as flexibility and good looks take precedence. What hasn’t changed at all though, is the German aptitude for precision planning and engineering. These qualities expressed in ‘made in Germany’ manufacturing are still a source of national pride and it shows. Just like Lihotsky, kitchen manufacturers today see a task-oriented space, but the best contemporary models allow for craft and creativity at a masterchef level. Equipment too must live up to professional standards. Those in the market for a fitted kitchen today are also looking at architectural tailoring so seamless that it’s no longer entirely clear where the dividing line between the kitchen and the rest of the home lies. If there even is one anymore. Technology, units and islands blend into the structure of the space – look, no handles; listen, no rumbling appliances. As kitchen and living space become increasingly fused, designers are better able cater to the complex and variable needs of the postmodern consumer – today’s storage unit might just as well play home to a showpiece objet d’art as a handy jar of deli-fresh sauerkraut. The Frankfurt kitchen was a narrow double-file kitchen measuring 1.9 m × 3.4 m (6.2 ft × 11.2 ft). The entrance was located in one of the short walls, opposite which was the window. Along the left side, the stove was placed, followed by a sliding door connecting the kitchen to the dining and living room. On the right wall were cabinets and the sink, in front of the window a workspace. There was no refrigerator, but there was a foldable ironing board visible in the image folded against the left wall. 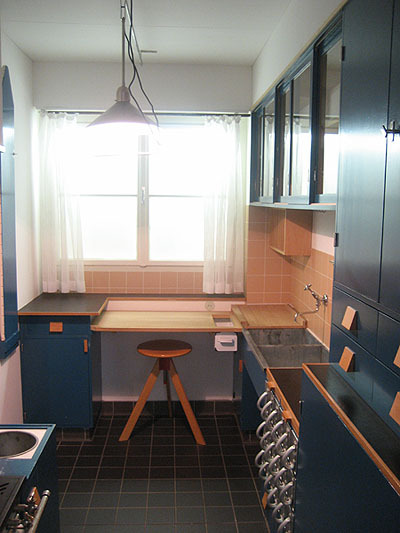 Kitchens in the 1930s until the 1960s in Germany were often smaller and less comfortable. 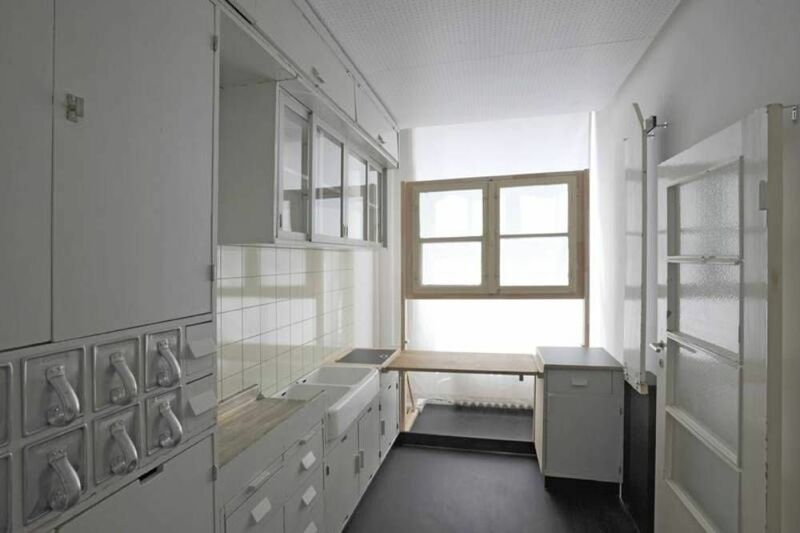 Housing societies thought that the Frankfurt kitchen was too luxurious. 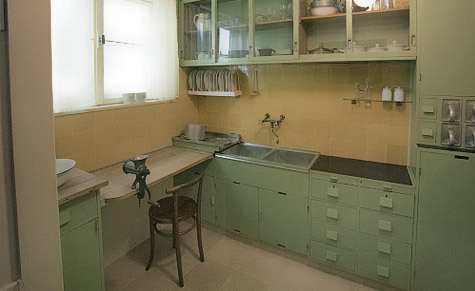 But the principles of this kitchen were adapted in other countries like Sweden and Switzerland and reimported to Germany, and recognized to be the same like the Frankfurt kitchen before. The major difference of most of the later kitchens was that the Frankfurt kitchen used relatively expensive materials and not particle boards. 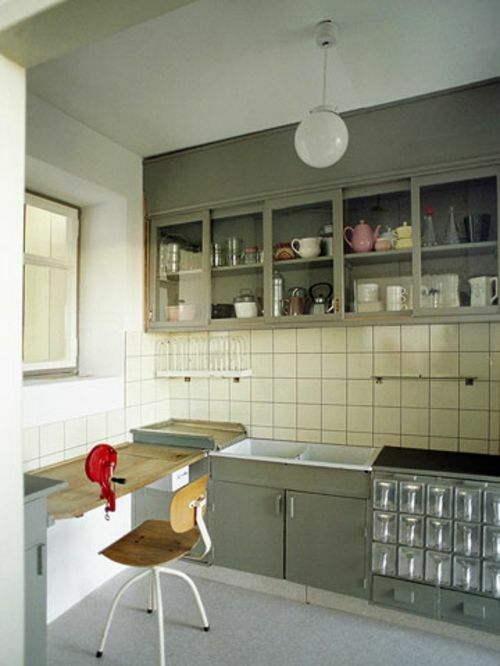 Erna Meyer responded to the criticisms of the Frankfurt kitchen with her Stuttgart kitchen, presented in 1927. It was slightly larger and had a more square ground plan, and used unit furniture in an attempt to make it adaptable to both the future users’ needs and different room shapes. Das Problem, die Arbeit der Hausfrau rationeller zu gestalten, ist fast für alle Schichten der Bevölkerung von gleicher Wichtigkeit. Sowohl die Frauen des Mittelstandes, die vielfach ohne irgendwelche Hilfe im Haus wirtschaften, als auch Frauen des Arbeiterstandes, die häufig noch anderer Berufsarbeit nachgehen müssen, sind so überlastet, daß ihre Überarbeitung auf die Dauer nicht ohne Folgen für die gesamte Volksgesundheit bleiben kann. “The problem of rationalising the housewife’s work is equally important to all classes of the society. Both the middle-class women, who often work without any help [i.e. without servants] in their homes, and also the women of the worker class, who often have to work in other jobs, are overworked to the point that their stress is bound to have serious consequences for public health at large. However, the users of these kitchens often had their difficulties with them. 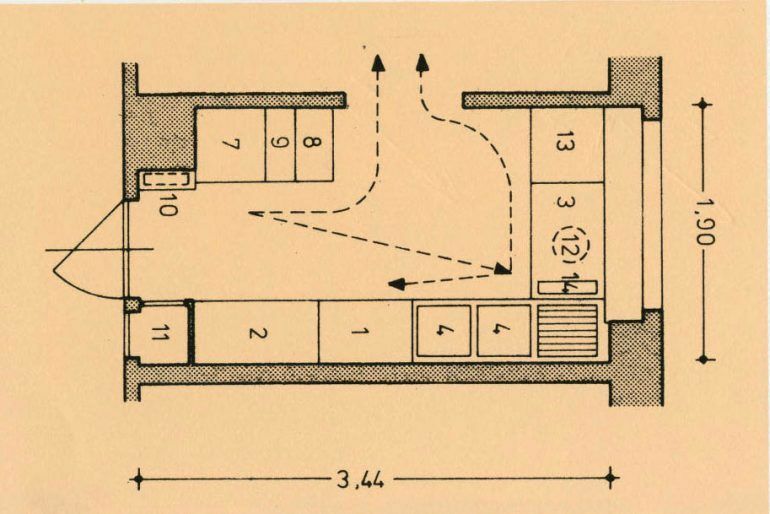 Unaccustomed to Schütte-Lihotzky’s custom-designed workflows for which the kitchen was optimised, they often were at loss as to how to use the kitchen. It was frequently described as not flexible enough—the dedicated storage bins often were used for other things than their labels said. Another problem with these bins was that they were easily reachable by small children. Schütte-Lihotzky had designed the kitchen for one adult person only, children or even a second adult had not entered the picture, and in fact, the kitchen was too small for two people to work in. Most contemporary criticism concentrated on such rather technical aspects. 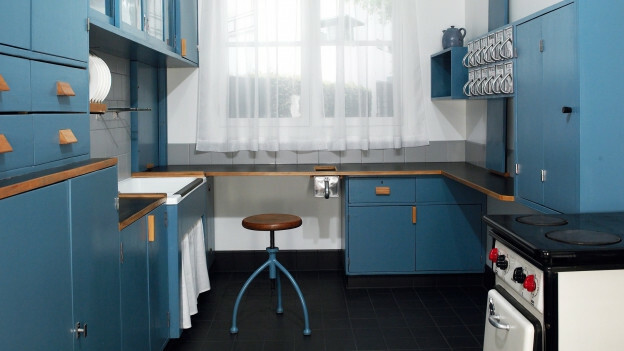 Nevertheless, the Frankfurt kitchen became a model for a modern work kitchen. 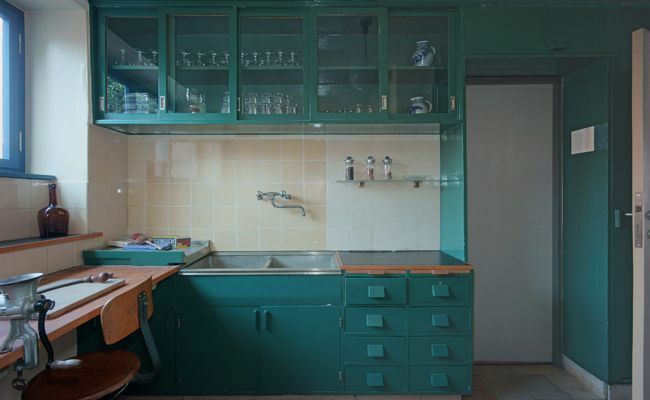 For the rest of the 20th century, the small, rationalised work kitchen was a standard in tenement buildings throughout Europe. Sociological aspects of the “work kitchen” were criticised only much later, in the 1970s and 80s, when feminist criticism found that the emancipatory intentions that had in part motivated the development of the work kitchen had actually backfired: precisely because of the specialised rationalisation and the small size of these kitchens such that only one person could work comfortably, housewives tended to become isolated from the life in the rest of the house. What had started as an emancipatory attempt (although all proponents such as Beecher, Frederick, or Meyer had always implicitly assumed that the kitchen was the woman’s domain) to professionalise and revalue work in the home was now seen as a confinement of the woman to the kitchen. Dedicated, labelled storage bins for common ingredients such as flour, sugar, rice and others were intended to keep the kitchen tidy and well-organised; the workspace had an integrated, removable “waste drawer” such that scraps could just be shoved into it while working and the whole thing emptied at once afterwards. 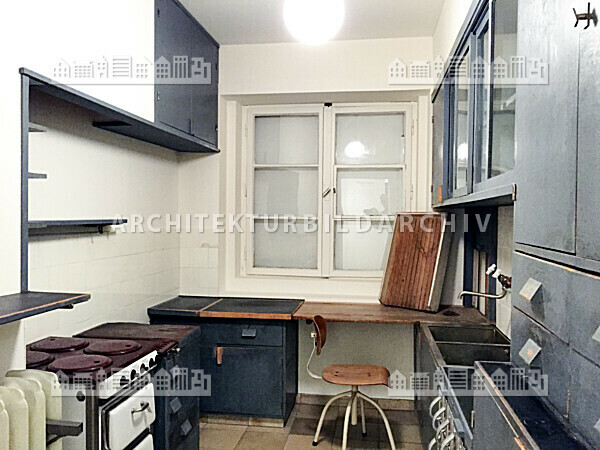 Because conventional kitchen furniture of the time fit neither the new workflows nor the narrow space, the Frankfurt kitchen was installed complete with furniture and major appliances such as the stove, a novelty at that time in Germany. It was the first fitted kitchen. The wooden door and drawer fronts were painted blue because researchers had found that flies avoided blue surfaces. Lihotzky used oak wood for flour containers, because it repelled mealworms, and beech for table tops because beech is resistant to staining, acids, and knifemarks. The seating was a revolving stool on castors for maximum flexibility. This quote succinctly sums up the reasons for the appeal of Taylorism at the time. On the one hand, the trend to rationalise the household was reinforced by the intention to reduce the time spent in (economically speaking) “unproductive” housework, so that women had more time for factory work. On the other hand, emancipatory efforts to improve women’s status, also in the home, called for rationalisation to relieve women and enable them to pursue other interests. Schütte-Lihotzky’s Frankfurt kitchen was installed in some 10,000 units in Frankfurt and as such was a commercial success. 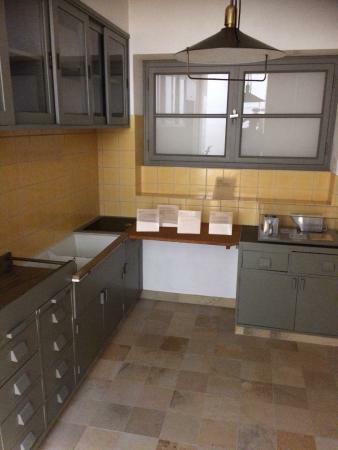 The cost of a single kitchen, fully equipped, was moderate (a few hundred Reichsmark); the costs were passed on to the rent (which reportedly increased the rents by 1 RM per month). 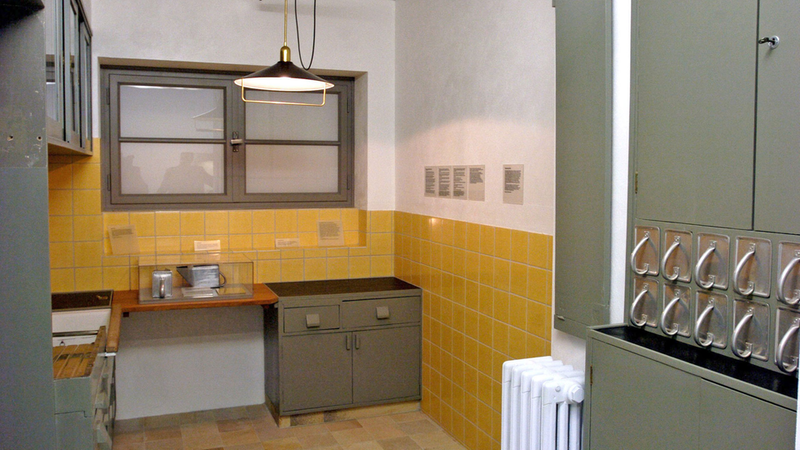 In 2005 the Victoria and Albert Museum acquired a “Frankfurt” kitchen for its traveling exhibition “Modernism: Designing a New World” with stops in London, the USA and Germany. 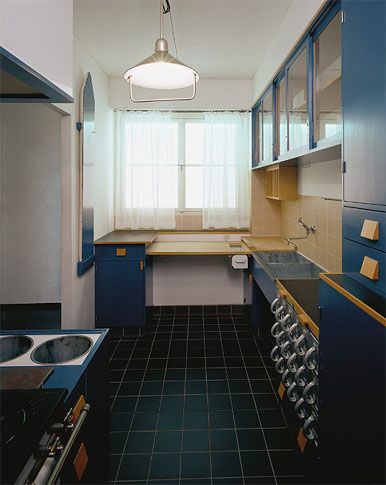 The kitchen was dismantled from its original place, restored and repainted. Historical Museum, Frankfurt Museum der Dinge, Berlin Germanisches Nationalmuseum, Nuremberg University of Wuppertal Design collection, Wuppertal Badisches Landesmuseum Karlsruhe, Karlsruhe Museum of Applied Arts (MAK), Vienna (Reconstruction) Minneapolis Institute of Arts, Minneapolis, Minnesota Museum of Modern Art, New York Victoria and Albert Museum, London See also Kitchen cabinet References External links Wikimedia Commons has media related to Frankfurt kitchen. Reconstruction of the Frankfurt Kitchen in the Museum of Applied Arts (MAK) Vienna V&A Museum exhibit Die “Frankfurter Küche” – very thorough, but also in German. The “Monats-Anzeiger”, Nr. 276 (March 2004) of the Germanisches Nationalmuseum in Nuremberg has a section of the Frankfurt kitchen with description (in German) and images. Measuring a meager 1.9m x 3.4m, and inspired by the compact kitchen facilities of the luxury modern railcar, Lihotsky invented the first mass-produced fitted kitchen, and the world has never looked back. 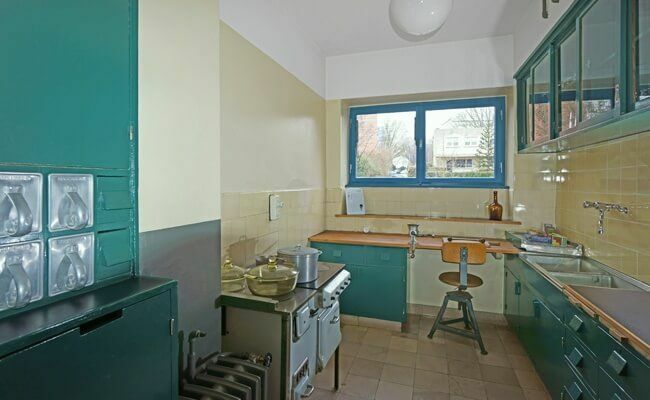 The Frankfurt kitchen was a milestone in domestic architecture, considered the forerunner of modern fitted kitchens, for it realised for the first time a kitchen built after a unified concept, designed to enable efficient work and to be built at low cost. It was designed in 1926 by Austrian architect Margarete Schütte-Lihotzky for architect Ernst May’s social housing project New Frankfurt in Frankfurt, Germany. Some 10,000 units were built in the late 1920s in Frankfurt. German cities after the end of World War I were plagued by a serious housing shortage. Various social housing projects were built in the 1920s to increase the number of rental apartments. These large-scale projects had to provide affordable apartments for a great number of typical working class families and thus were subject to tight budget constraints. As a consequence, the apartments designed were comfortable but not spacious, and so the architects sought to reduce costs by applying one design for large numbers of apartments. 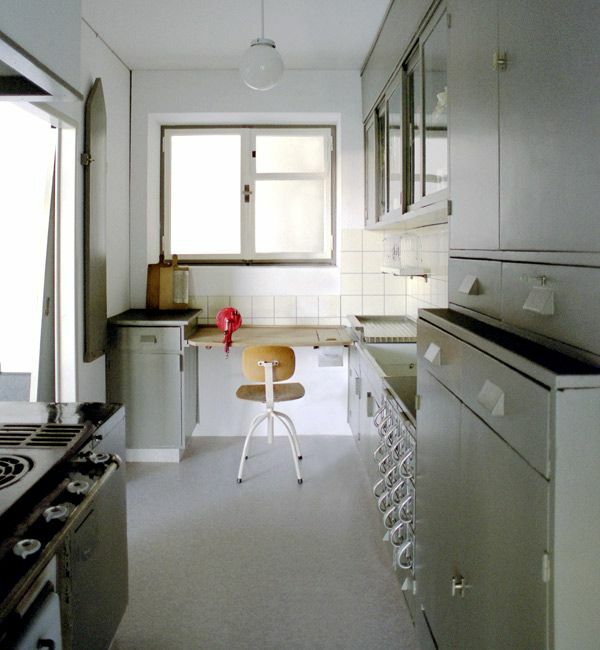 Most Frankfurt kitchens were thrown away in the 1960s and 1970s, when modern kitchens with easy to clean surfaces like Resopal were affordable. 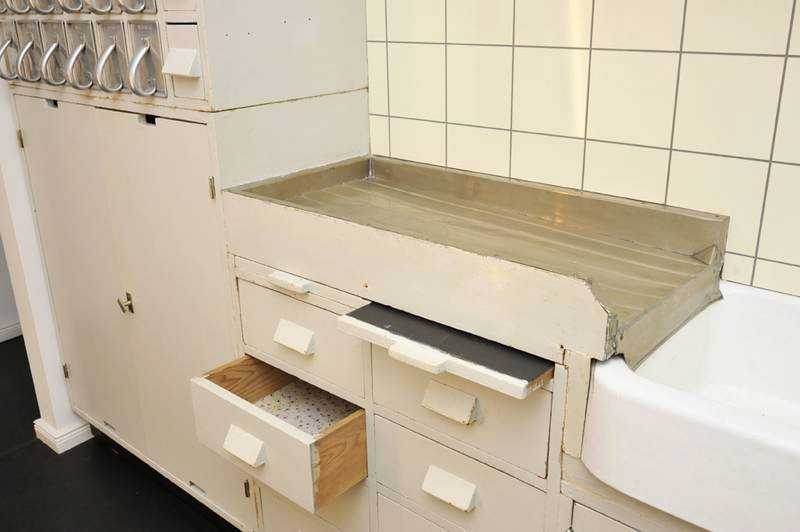 Often only the aluminium drawers survived, which aren’t typical of a modern kitchen. They were also sold separately for a few years by Haarer, the manufacturing company and chosen by architects and cabinet makers for their furniture. Schütte-Lihotzky was strongly inspired by the extremely space-constrained railway dining car kitchens, which she saw as a Taylorist ideal: even though these were very small, two people could prepare and serve the meals for about 100 guests, and then wash and store the dishes. 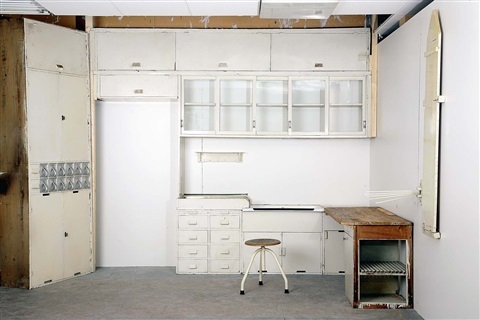 When the public interest on the work of Margarete Schütte-Lihotzky in the late 1990s was growing, most kitchens did not exist any more. Some homeowners have built replicas; a very few originals still exist. The original house Im Burgfeld 136, Frankfurt was chosen to be a museum because of the surviving Frankfurt kitchen. The narrow layout of the kitchen was not due solely to the space constraints mentioned above, it was equally a conscious design decision in a Taylorist attempt to minimise the number of steps needed when working in the kitchen. The sliding door also helped minimise the walking distance between the kitchen and the table in the adjacent room. 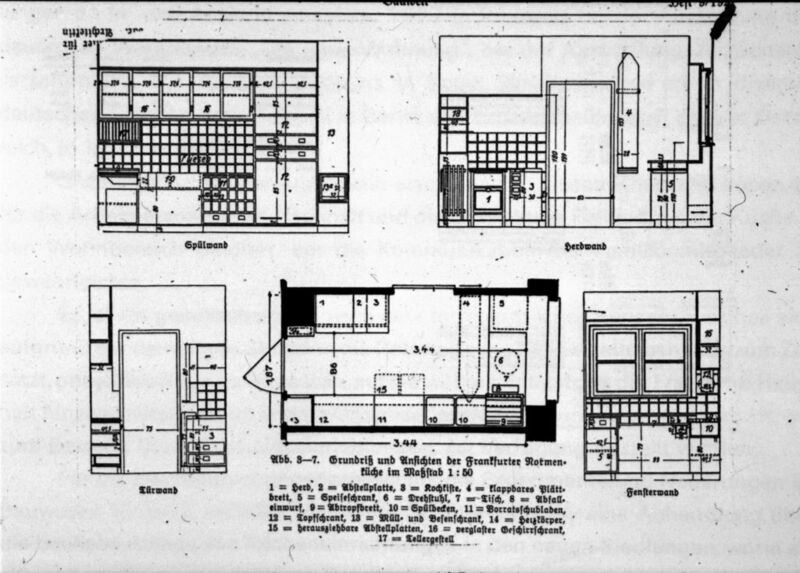 Schütte-Lihotzky actually designed three different variations of the Frankfurt kitchen. Type 1, the one described here, was the most common and least costly. She also designed “Type 2” and “Type 3”, which were larger, had tables, and were spacious enough for one or even two additional persons to help in the kitchen. These two latter types, however, did not have the impact her “Type 1” model had.